The award-winning Kinney Hot Rod Helicopter (HRH) is a true world-class, cross-country performer, with features that easily surpass those of virtually any other single-seat helicopter—a combination of good looks and outstanding maneuverability. Simply stated, no other design in its class offers the HRH's combination of smooth, light-touch controls and state-of-the-art performance, whether for sport flying or a wide range of practical applications. 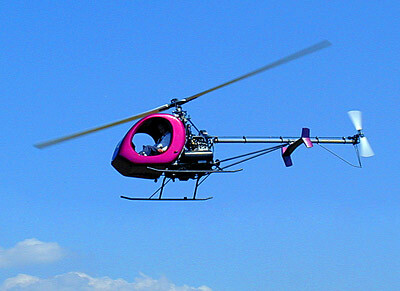 The outstanding features of the HRH include: a powerful 165 hp 4-cycle, 4 cylinder Subaru engine; a heavy-duty, sophisticated rotor head with full cyclic and collective pitch and an electronic system for maintaining rotor speed; long-lasting, composite main rotorblades; a shaft-driven tail rotor; an enclosed composite cabin with a fully equipped instrument panel; a vinyl-covered seat with comfortable energy-absorbing foam; a 4-point aircraft seat belt; and a tinted polycarbonate windshield; a powder-coated airframe formed of aircraft-grade 4130 chro-moly steel.